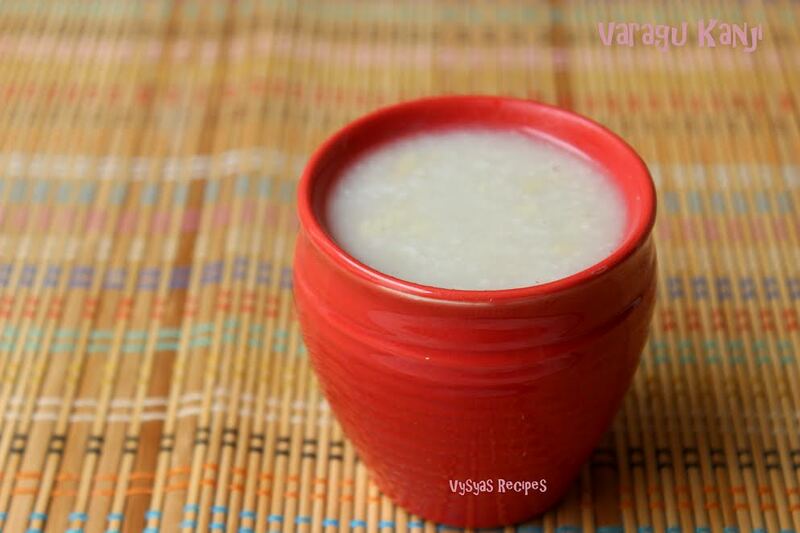 Varagarisi Kanji is a healthy Porridge recipe, made with kodo millet, urad dal & Garlic as Main Ingredient. This porridge is served as a breakfast Recipe. Here i have replaced rice with kodo millet. Kodo millet is great for weight loss. It also reduces diabetes. Kodo millet has shown to reduce knee and joint pain, helps regularise menstruation in women among others. Varagarisi(kodo Millet) - 1/2 cup. urad dal - 1/2 cup. Coconut Milk - 1 cup. Grate the coconut and add boiling water to it , and let it sit as such for 5 min, till it cools down.Then run it in a mixie or blender to a smooth paste.Then squeeze this smooth paste, to extract the milk.Run the remaining residue another time in a mixie to extract Some more milk. Now coconut Milk is ready. Wash & Soak Varagarisi for 1/2 an hour in water. Add urad dal in a cooker & saute for few minutes, till it turns Golden brown colour. Then add 5 cups of water & add soaked kodo Millet & salt. Add Garlic, mix well & let it cook in medium flame for 5 whistles. When the pressure subsides open the lid & Mix well . Serve hot with pickle or Thogayal. Instead of coconut milk, you can add 1/2 cup of Grated coconut & 1 cup of Milk, for different taste. I used kodo millet, you can use foxtail Millet(Thinai arisi) or Barnyard Millet(kuthiraivali Arisi) or Prosco Millet (Pani Varagu) to make this porridge. Kanji becomes thick, after it cools down. So adjust the water accordingly. you can also use split black urad dal with skin.